6 Carrot Flavoured Wheat Flour Tortilla Wraps. 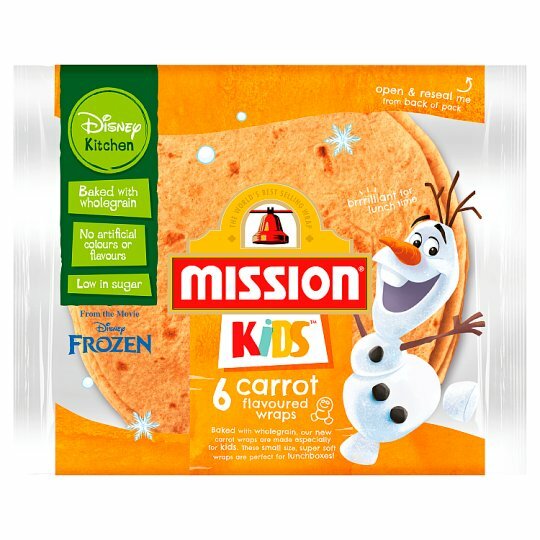 Baked with wholegrain, our new carrot wraps are made especially for kids. These small size, super soft wraps are perfect for lunchboxes! Store in a cool, dry place., Suitable for home freezing: Freeze immediately and use within 3 months. Defrost thoroughly before use., Once opened, re-close at seam and use within 2 days. Try our Stay Cool Rainbow Wraps! Spread a carrot wrap with low fat cream cheese & top with cucumber matchsticks, sliced red pepper & any other crunchy veggies your kids love. Roll & cut to reveal the rainbow!